Our online marketplace, greenpicks.de/en, offers fairtrade products all year-round, and we are pleased to highlight the theme during the Fair Weeks in September. This is a great opportunity to sensitize consumers to fair trade products. Worldwide working means securing the basis of life. So much for the theory. While in some countries of the world a so-called minimum wage is paid to employees, such regulations are missing, especially in developing countries. As a globally organized system, fairtrade protects people from exploitation. Regardless of the market value of the products, producers are always paid a minimum fairtrade price. This allows small and medium-sized producers and enterprises in developing countries to live from the production and sale of the goods while at the same time respecting environmentally sound aspects. Farmers and producers are organized in cooperatives that receive premiums for social projects. Thereof are being built, for example, schools, hospitals and drinking water fountains. Also, income flows into health care and social institutions. Anyone who buys fairtrade products also invests in the sustainable future of their fellow human beings and nature. Specifically, this means conscientiously consuming in the present, for a goal that is not always immediately visible: conservation and preservation of our planet for future generations. In fair trade, child and forced labour are taboo. The change to organic farming is generally encouraged and rewarded with additional premiums. Protective clothing is provided to people, social and medical precaution and paid holidays are secured. Achievements that are taken for granted for us. How do you recognize Fairtrade products? Unfortunately, there is no consistent Fairtrade seal. The most widely distributed certificate is given by the FLO to producers in developing countries who are committed to the principles of Faitrade – socially and environmentally sound. Based on the logos of the Fair Trade organizations GEPA, El Puente, BanaFair and dwp, fairtrade products can be identified. Companies that demonstrate that they meet all fair trade criteria can receive the World Fair Trade Organization (WFTO) label. Organizations such as the world shops’ umbrella association or importers (such as the shop Sundara Paper & Art at Greenpicks) or the Fair Trade Forum can be certified concerning to the WFTO’s warranty system. In Germany you will find mainly two product labels for fair trade. Only products from the Global South that meet the requirements of the international Fairtrade standards may bear the Fairtrade seal, which is awarded in Germany by TransFair e.V. Products that are manufactured according to the Naturland guidelines for ecological and fair production can be awarded the Naturland Fair seal. How much is Fairtrade in organic, how much organic is in Fair trade? However, while fair trade focuses on people and fair wages for their work, the protection of the environment is inextricable from a fair economic system. Fairtrade does not necessarily mean that coffee, tea and clothing are produced in organic quality. Conversely, organic products are not necessarily fairtrade. Nevertheless, the tendency is increasing. Fairtrade certificates and organic seals meld. Many products, including at Greenpicks, are now both fairtrade certified and labeled with organic seals such as GOTS (Global Organic Textile Standard), FSC® (Forest Stewardship Council®), demeter etc. 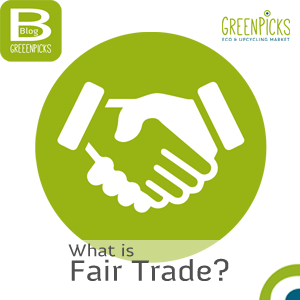 The Greenpicks sustainability criterion “Fair & Social” is based on regional and international standards of fair trade. In addition, the in-house seal also considers products that are manufactured under socially acceptable conditions. On every category page, in every eco online shop and in all organic brands, interested consumers will find corresponding articles about the filter “sustainability criteria » fair & social “. The Fairtrade product line at Greenpicks does not only cover foods such as tea, coffee and chocolate but also fair trade fashion for babies, children, women and men; bags & backpacks, Fairtrade jewellery, toys, housewares, furniture as well as pet supplies & pet food. Consumers are dependent on the offer. If there are no fair trade products, you can only do without as far as you do not want to buy ordinary products. Consumers can only put pressure on concerns if they buy or consciously leave their products. It is not enough to revolt – about inhuman working conditions, about child labour, about plastic waste in the ocean. Civil disobedience, bringing into question, understanding and hands-on action is an instrument of power to change something with the shopping basket. This provides the opportunity to influence the conditions in the value chains. Headquarters of Greenpicks – Eco & Upcycling Market is in the Fairtrade Town of Cologne. Coincidence or destiny? Presumably, the owner, Annette Husmann, was cradled to work for a fair world. Even before her studies in “Strategic Sustainability Management”, she was involved with the bilingual online marketplace Greenpicks in ensuring that the fair and ecological products offered convince as many people as possible. In addition, she advises unpacked shops and participants of GIZ programs on topics such as upcycling and sustainability. 5 Years Greenpicks ! – Recycling Raffle!